So it's been a while since we've sent a newsletter updating you on your Sage ERP application and the goings on at Arxis. But this is a new day! It's the start of our more regular and more strategic efforts to provide the information you need to get the most from your software and your relationship with Arxis. 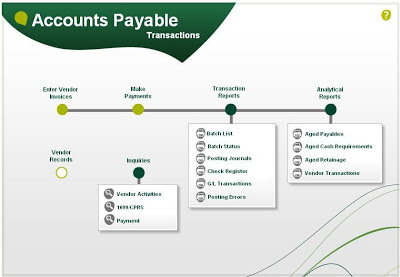 As we look to get back on the proverbial horse, I'm excited to let you know about a great new feature in Sage 100 ERP 2013. Sage 300 2012, and Sage 500 2013 - Visual Process Flows. These diagrams provide a step-by-step diagram of your most important business processes, enabling greater standardization and efficiency in completing daily / weekly / monthly tasks. It's just one of the new features in the latest version of Sage 100, Sage 300, and Sage 500 ERP. Don't hesitate to contact me with any questions or to schedule an upgrade. Visual process flows are interactive workflow diagrams that show the steps to complete a task or process. Elements on the process flows are linked to Sage 300 ERP tasks; clicking an element starts the linked task. Other actions, such as showing or hiding objects on the process flow, can also be assigned to elements. Seven predefined process flows are available on the Visual Process Flows sub-menus. You can use these predefined process flows as templates to create your own customized process flows, which appear on the Custom Process Flows menu in the applicable modules. The Visual Process Flows Manager task, located on the Visual Process Flows Setup menu, allows you to create, copy, and delete custom process flows, modify their settings, and open them in the Visual Process Flow Designer. For more information on the great new features in Sage 100 2013, we invite you to peruse the following documents or contact your Account Manager, Minh Tram. For more information on the great new features in Sage 300 2012, we invite you to peruse the following documents or contact your Account Manager, Lindsey Palladino. For more information on the great new features in Sage 500 2013, we invite you to peruse the following documents or contact your Account Manager, Minh Tram.